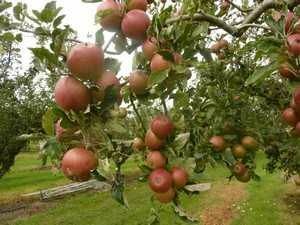 Winston - Apple Tree £12.75 - Dessert Apples - Late Season Apple Trees and Fruit Trees For Sale. Buy at competitive prices with wholesale discounts. 'Winston' produces a lovely small, streaky red flushed eating apple. It has a crisp, crunchy texture and much of the rich aromatic flavour found in 'Cox', but with more acidity. This richness mellows and sweetens with storage resulting in a more delicate flavour. The tree itself is a moderately vigorous grower and a decent cropper. 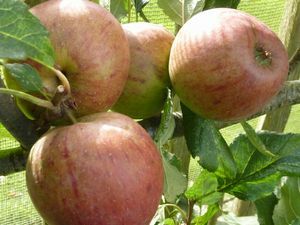 It's also worth noting that it generally remains quite compact and upright in size and shape, making it well suited to those with space limitations.<br> Formerly known as 'Winter King' this variety was first introduced in 1935 and renamed to honour Sir Winston Churchill after the second world war. 'Winston' produces a lovely small, streaky red flushed eating apple. It has a crisp, crunchy texture and much of the rich aromatic flavour found in 'Cox', but with more acidity. This richness mellows and sweetens with storage resulting in a more delicate flavour. The tree itself is a moderately vigorous grower and a decent cropper. It's also worth noting that it generally remains quite compact and upright in size and shape, making it well suited to those with space limitations. 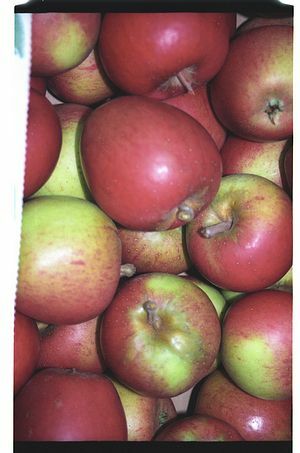 Formerly known as 'Winter King' this variety was first introduced in 1935 and renamed to honour Sir Winston Churchill after the second world war.